Manhattan, NY RYBAK Development has launched plans for a new development project – Manor82. This limestone development is located in the Upper East Side neighborhood at 333 East 82nd St.
On December 19th, 2018, RYBAK Development closed on UES assemblage of four townhouses; 331, 333, 335 and 337 for $23 million. Manor82 shall be a 21-unit condominium project with a unit mix consisting of one, two, three-bedroom, duplex townhouses with terraces and PH units with 18-ft. ceilings and a community facility space at the ground and cellar levels. The project has been filed to be composed on 35,875 FAR s/f. Features of Manor82 will include limestone intricate façade, marble slab baths, Italian interiors, herringbone flooring, doorman, package room, cold storage, terraces, a gym, a kids’ playroom and parking. “Over the past decade, the RYBAK brand has become synonymous with structural quality, operational efficiency, and product innovation. 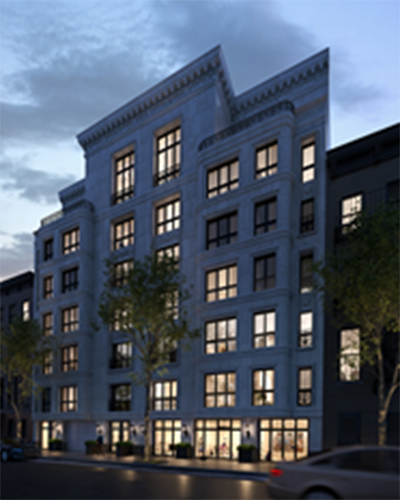 RYBAK is proud to present Manor82,” said Jason Reznik, principal, RYBAK Development.